Since its formation in 1936, the American Hockey League is recognized as the top development league – providing almost 90% of the players – for the NHL. Currently, sixteen clubs vie for the American league’s coveted championship trophy: the Calder Cup. Another sought after trophy in that league is the Harry “Hap” Holmes Memorial award. Named after a local who was born in Aurora 1888, the Harry “Hap” Holmes Memorial Award has been presented since 1948 in recognition of outstanding goaltending. Hap was also easily recognized on the ice by the cap he used to wear while playing – keep in mind they did not wear masks or helmets at this time. 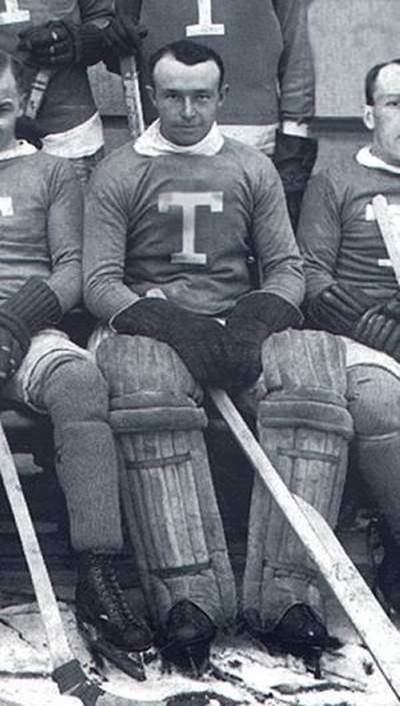 Harry Holmes or “Hap” was a prominent figure in early professional hockey and an outstanding – stand-up style – goaltender in his era. Hap played 103 games in the NHL from 1912 to 1928 and he won the Stanley Cup four times with four different teams. Leafs fans will be happy to know that Hap has ties with that team, having played on and won 2 Stanley Cups, one with the Toronto Blueshirts and then with Toronto Arenas in 1918 – the year they became known as the Toronto Maple Leafs. This past season marked the 100th anniversary of the Leafs and during that time, 98 goalies have worn the Blue and white: one of them was Aurora’s own Hap Holmes. Hap and his family lived on Centre Street in the heart of Aurora. Hap was inducted posthumously into the Aurora Sports Hal of Fame in 2013. Proper caretaking of sport history is an honour bestowed upon the Aurora Sport Hall of Fame by those it recognizes, its donors and supporters.